So I finally seem to have permission to post here, and it kind of bothered me that for those of you existing solely on these forums you only get the Entente point of view unless I mention something out of hand. So without further ado, I will be posting all future OttoUpdates here as well . The previous ones can be found in the Paradox OT CP thread which is linked below, and if you have any specific questions feel free to ask. It was fairly quiet on the Ottoman sector of the front this turn, but don't worry, I'll be updating on the other major events too. Initially this turn we will start on the Xanthi front, where the depot of Sufli is begun to help keep up a steady stream of supplies to Xanthi in adverse weather. Now into Anatolia. The Italians have landed a pair of corps far away from one another, probably to annoy me and try to draw away forces from other fronts. Irritating but no big deal as each seems to be only a corps or so. I send Nazim Pasha from Antalaya to deal with the Italians outside of Izmir this turn. While under normal circumstances I would trust the Izmir garrison to handle a lone corps alone under the guns of the Italian fleet I'd rather play it safe. I specifically target the Italian force and not the province for movement so I can get them even if they move. In Palestine I set up a game of table tennis with the remnants of the British army as the ball, hopefully I should eliminate some of their divisions from the order of battle this turn. Now that all British MC is finally eliminated in Kuwait I decide to go ahead and send Nazim Pasha up to a position from whence he would be able to move into Persia when the time comes. The entente have Afghanistan aligned to them about 10% less than we have Persia to us and I don't want the Qajar sha to prove a liability. Aden falls by assault to 3. Ordusu this turn. With that done with I move the army to position to suppress the Arab revolt when the time comes. The Germans defeat the Russians outside Riga and place the city under siege. As I understand it, TLG will now be transporting a good number of these troops south to the Polish front. They also defeat the Russo-Romanian army at the end of the Northern pass and drive them away from Bucharest. And destroy a Romanian cavalry division as well. The French "Win" against Lettow-Vorbeck in Africa. Current Russian player in the third Paradox OT Forums Mass AAR. Former Ottoman Player in the first Paradox Forums TEAW Mass Multiplayer AAR. Victor of Tripoli, Tyr, and Xanthi. Defender of the Holy Cities of Jerusalem, Mecca, and Medinah. Conqueror of Kuwait and Kitchener. Bane of the British and Sword of the House of Osman. Militant confederate in my spare time. Not as much happening this turn so this will be a shorter update. First we go to Palestine, where I unfortunately only manage to catch the British once last turn. Their mostly-disintegrated forces are currently milling about on the shore in Nabluz and Haifa. A single portuguese transport has arrived, but it is only a single squadron and has only enough lift capacity for three divisions. I imagine that will cause riots on the beach as to who gets to go and who is forced to stay. I forgot to mention but those Portuguese transports are getting mined into oblivion so the ordeal for any british wo manage to make it on to the ships is not likely to be over yet. I go ahead and finalize the setup for killing the Arab revolt when the Entente fire it on the first turn of 1916 this turn. There are three ways out of Arabia. One is the Hedjaz, one is Maan, and one is in the middle of nowhere. I break off a Kolordu under Karebekir Pasha from 3. Ordusu to guard the one in the middle of nowhere. The rest of 3. Ordusu will guard the Hedjaz, and the killing blow will come from 1. Ordusu out of Maan. I have no intention of letting this thing go on for more than a turn or two. In addition, I start steadily securing the rail line through the Sinai with a cavalry division in preparation for the (re)conquest of Egypt once the Arabs have been dealt with. As mentioned in the General thread, the western Italian raid has fled. I send a lone cavalry division to go and eliminate the 10% western entente MC over the Province they were in. As for the Eastern raid Nazim Pasha and his Kolordu is sent to deal with the Italians there and resecure one of the rail junctions. In Romania the Romanians are driven away from Bucharest. TLG has expressed wished that the city be assaulted ASAP and the gap between the thrusts squeezed out as soon as possible due to the supply situation and a wish for his troops to become available again on the Polish front. In Galicia the Austro-Hungarians defeat the Russians again outside Lemberg. And in Lithuania the Russians are defeated by the Germans at Kowno. Wilna is now easy pickings for a counterattack. And finally, in Africa it looks like Lettow-Vorbeck is finally about to fall, as he is down to an understrength field artillery unit and a supply train. This could have used an intro with screenshots(of all the theaters), and a picture of the score screen. Yes, I know there are other threads. It would make it easier to get into the current situation. TXcavalier wrote: This could have used an intro with screenshots(of all the theaters), and a picture of the score screen. Yes, I know there are other threads. It would make it easier to get into the current situation. Great AAR!!! I follow up!!! Is there another way to view the previous turns? The link to Paradox only allows access to anyone with a registered game. Wow the Central Powers have a huge morale edge. How did that happen? Sorry for taking so long. The entente are so slow. elxaime wrote: Wow the Central Powers have a huge morale edge. How did that happen? A long series of victories. There were a couple of German Naval Victories, I've won a series of decisive victories over the British on land, and the Austrians have been giving the Russians hell. Von Rundsted wrote: Great AAR!!! I follow up!!! Is there another way to view the previous turns? The link to Paradox only allows access to anyone with a registered game. Not really. Sorry I suppose I could find the previous ones, do you really want to read all 26 of them? Slow turn this time, not much going on. First we go to Palestine where skirmishes with the collapsing British forces continue and I continue to press them hard. The Cavalry Corps is sent in to Nabluz to join the pressing. I decide to put 1. Ordusu in Aden for now instead of Maan. Here's why, the British can see into Maan and if von Murrin thinks I will instantaneously crush the Arab revolt he will wait to trigger it until the forces are needed elsewhere. I must hide the army for now so that I can crush the Arabs. Finally, I send my cavalry Division at El-Arish forwards to cross into the Sinai to begin securing the Railway into Egypt. In Mesopotamia I begin putting Nazim Pasha's Kolordu onto transports and shipping them north to Baghdad. From there they will wait until Persia passes 90% and then move into position to support them. Nazim Pasha's Kolordu moves in on the other Italian raid after resecuring the northern railway junction. This turn the German fleet under Hero-Admiral von Ingenohl will seek out a decisive battle with the Anglo-Japanese fleet. And the Austrians defeat the Russians at Lemberg. Towards victory Central Powers!!! 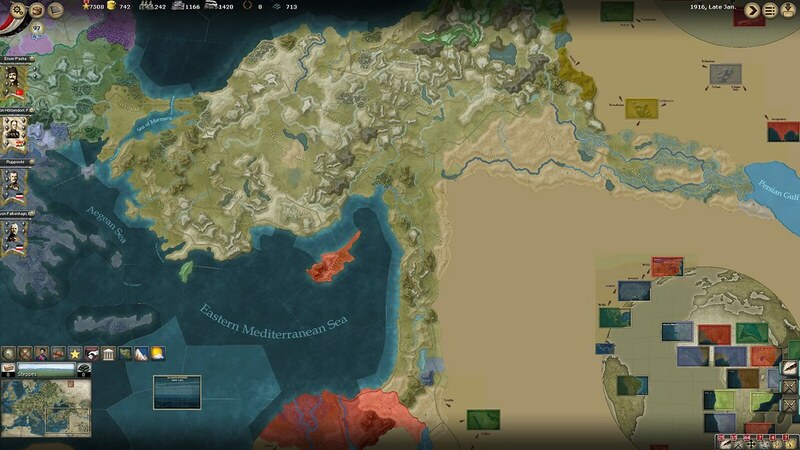 If possible, I would read the 26 turns, I would like to see the war plans that chose both sides, movements, recruitments, decisions and from what I saw the firsts turns are the most important of the game. Von Rundsted wrote: Towards victory Central Powers!!! If possible, I would read the 26 turns, I would like to see the war plans that chose both sides, movements, recruitments, decisions and from what I saw the firsts turns are the most important of the game. I don't have the first few turns, only from December 1914 when the OE entered. But Germany went with Moltke, AH with Conrad, and France with the default. Projekt Pasha wrote: I don't have the first few turns, only from December 1914 when the OE entered. But Germany went with Moltke, AH with Conrad, and France with the default. Thanks Projekt Pasha!!! And Russia use the Historical Plan?? Didn't the Russian player see your two armies behind Lemburg waiting to march to the sound of the guns? He got outnumbered 348K to only 83K ... a suicide attack!! ajarnlance wrote: Didn't the Russian player see your two armies behind Lemburg waiting to march to the sound of the guns? He got outnumbered 348K to only 83K ... a suicide attack!! They aren't mine, they are the Austrian player's (TXcavalier/Anglo-American). As a result I'm not entirely certain but I am fairly sure that he has been using the Railway network to manage an elastic defense, his armies flying in between Lublin and Galicia to counter a much larger number of Russians. Railroads have definitely been the key to my defense as Austria-Hungary. For that battle, I think he made the assumption that I would rail north to Lublin. My armies had been shifting, between Lemberg and Lublin, for the last two or three turns. Defeating all of his invasion attempts in the process. Even though he lost a battle badly, some Russian units were left across the river in the north. So, I didn't want to fight there without the advantage of the river line. I rely on my 'School of Defense' generals Dankl (defense 4) and Von Bohm-Ermolli (defense 3). In good terrain they have been shredding the Russians heartlessly. Which has allowed me to devote units to squashing Romania despite being outnumbered three to one. TXcavalier wrote: Railroads have definitely been the key to my defense as Austria-Hungary. For that battle, I think he made the assumption that I would rail north to Lublin. My armies had been shifting, between Lemberg and Lublin, for the last two or three turns. Defeating all of his invasion attempts in the process. Even though he lost a battle badly, some Russian units were left across the river in the north. So, I didn't want to fight there without the advantage of the river line. I rely on my 'School of Defense' generals Dankl (defense 4) and Von Bohm-Ermolli (defense 3). In good terrain they have been shredding the Russians heartlessly. Which has allowed me to devote units to squashing Romania despite being outnumbered three to one. yes, the austrians do get some good defensive generals. playing as the cp in my own pbem the problem at the start in 1914 is that the austrians only get two ammo dumps and are therefore very limited in their ability to use artillery early on. how did u solve that problem? i have even been toying with the idea of sending german ammo dumps to the austrians. do u know if that will work? ajarnlance wrote: yes, the austrians do get some good defensive generals. playing as the cp in my own pbem the problem at the start in 1914 is that the austrians only get two ammo dumps and are therefore very limited in their ability to use artillery early on. how did u solve that problem? i have even been toying with the idea of sending german ammo dumps to the austrians. do u know if that will work? I think it will work fine. Austria has had a couple new ones built this game. You think Austria is short with two? The Ottomans start with zero. Projekt Pasha wrote: You think Austria is short with two? The Ottomans start with zero. Ottomans start with zero... I must remember that when they join my PBEM game as the CP. Ammo dumps are expensive to build aren't they? ajarnlance wrote: Ottomans start with zero... I must remember that when they join my PBEM game as the CP. Ammo dumps are expensive to build aren't they? I think you mean munitions trains. They are expensive. Around 200 gold and 400 war supply. Munitions factories are made by event, and you will need some of those. TXcavalier wrote: I think you mean munitions trains. They are expensive. Around 200 gold and 400 war supply. Munitions factories are made by event, and you will need some of those. Almost nothing at all happens this month, I make the decision to not conquer Egypt once the Arab Revolt fires and is Crushed but to instead send more troops to the Balkans. This decision seems to please Austria-Hungary, prompting a rare moment of offensive Elan from the generally "School of the Defense" play style Anglo-American has. (Note for AGEOD forums: This is not a criticism, Anglo/TX is the best defensive tactician we have) We play the Rohr's Assault Battalion event and research as fast as our engagement points allow. We miss an opportunity to hit the British fleet due to a rerun of the turn (The Entente screwed up their files and they needed to be resent and reprocessed) and the fallout from this eventually caused the Italian player, Jarkko, to go one a paranoia-fueled and wholly unprovoked rant and then ragequit. (according to the Peanut gallery he did explain some more coherent reasons, but the rant still occurred nevertheless). Italy has been taken over by the far more level-headed Teep, the Japanese player who hasn't had much to do since Tsingtao fell. Tanks become available for us and Austria will get both of thiers this turn with Germany getting four the next, which will be formed into a Panzerkorps under Lettow-Vorbeck.